The Edwardians had clothing for every hour of the day and every activity, and they also had houses suited for individual activities as well! Shooting-boxes were residences either owned or rented for the sole purpose of housing a party of people gathered for the shooting season. Some were small estates, and others–typically in Scotland–were of a more utilitarian style: merely a few bedrooms for guests and a sitting room. 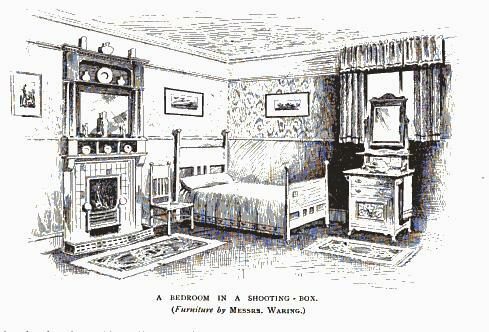 The following describes the suggested furnishing of a shooting box of the cottage variety. I am going to devote this paper to the requisites of a country home such as a shooting-box or a quiet cottage. Messrs. Hampton have just completed an ideal fitment for a sitting-room of the kind, which is herewith illustrated; it is a most comfortable, liveable room, artistic and pretty withal. Note the fireplace and its inglenook. In the far north, even in September, there will be a competition for those benches, especially by the sportsmen back from their day’s work, and I am afraid a good many of them will fall comfortably asleep there. The beam forms a shelf where old pewter jugs and brass candlesticks and any old pottery handy might find an appropriate place. Modern oak or old oak could be displayed to advantage above the corner couch, a most comfortable resting-place with a novel, when the sun is too hot or the day’s labour completed. You can step out of the window in a moment, into the garden, and however much writing you may happen to have to do, you can enjoy the air and the sunshine at the practical bureau by the window. It has comfortable drawers for tho disposal of papers, and the feet sink into the Turkish carpet placed in front of it. The gate-table holds papers, books, and maybe a pipe or two that are wanted ready to hand, to say nothing of the flowers, without which no living-room can be perfect. The shape of the flower receptacles here set forth can be hardly too highly commended, for they hold plenty of water and keep the flowers fresh: a few go a long way. There is an ample bookcase at the side and a dresser for old or modern china; a cupboard below for stowing away anything that is needed. This would not be at all expensive to arrange. The floor might be covered with felt or even Indian matting. It is both excellent to look at and a thoroughly comfortable apartment, the rafter roof being not the least of its many charms. At this well-known firm you may set yourself up with all kinds of treasures in the way of Nankeen porcelain, Sheffield plate, antique silver, old embroideries, laces, brocades, vestments, old Spanish embroidered pictures, French furniture of antique date covered with embroidery, ancient tapestries, and a wealth of old furniture of all periods. You may pay for them as liberally as such irreplaceable articles demand, but you may also find the requirements for a modest country home at very reasonable prices. I have been choosing there a number of odds and ends lately for such a purpose: a little corner table of carved oak with a flat top, twenty-one inches square when opened out, and twenty-eight inches high ; it costs under £1, but it is quite the joy of my life for the time being, and so is, a little round inlaid table, reproduction from an old model with a sixteen inch top, twenty-two inches high, which holds my flowers or a little bit of needlework. It can be set by an easy-chair, with a wealth of books to select from in the lazy hours in which we all indulge at this time of the year. Their revolving bookcases, of all heights and all sizes, appeal to me especially. One, which revolves and has a sort of small round table rising out of the centre at the top, is set on four legs, which support a shelf at the bottom, most convenient for newspapers. Its total height is over forty-three inches, and it can be obtained for under a five-pound note. 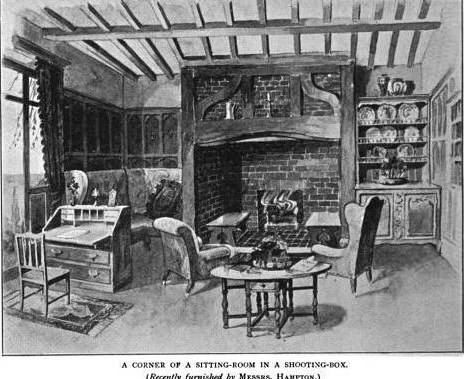 Some of them have two, some three, tiers of bookshelves, and they range from thirteen inches to four feet high, and the number of books they can stow away is simply marvellous; you can- have them circular, oblong, square, anything you like, and one thirty-four inches high has a nest of three drawers combined in it. I find it a perfectly delightful addition to a little country home. Throughout, the quality and artistic merit of their productions are unassailable, notwithstanding the really moderate prices. Cheap rubbish is dear at any price. Anyone wishing to furnish for a certain sum can do so, the estimates covering linen, china, cutlery, ironmongery, and kitchen requisites; and the firm forwards not only copious coloured illustrations, but a list of what they supply for each room. In furnishing for the country let me suggest a spinning-wheel chair and a grandfather clock as most desirable adjuncts. I have in my mind’s eye a very comfortable dining-room, furnished by them, with a good Turkey carpet and oak furniture. The oak sideboard was particularly charming with a copper frieze let in at the back, cellarettes on either side surmounted by a drawer, a couple of drawers in the middle, with the knee-hole below, for bestowing bottles, the front being five-sided. The pretty oriel window of the room had a comfortable cushioned seat, covered with tapestry; the colouring throughout was most reposeful. I am so glad to find that the canopy beds, which used to be purely French, have once more come into favour. They are very graceful, and they make it much easier to place a bed in the corner of the room. For the country, wicker-work chairs and ash-stained furniture are all that is needed. I am not thinking so much of a permanent residence as a home to which we flit when we can get away from town. In sitting-rooms the chimneypiece is generally the chief structural feature, which consequently demands much attention; and it is astonishing how we have improved in their design of late years, while we are able to have what is beautiful without spending overmuch “siller.” For bedrooms there is nothing so cheap as the painted iron chimneypieces, for they are to be had as low as a guinea; but of course, if you are prepared to pay more money you may have pine with black grates, and tiles for the side, and black and brass grates and glass let in for the overmantels, or the overmantel may include pretty woodwork with receptacles for china. Old Adam’s patterns have been revived, and comfortable old hobs of long ago in cast iron. 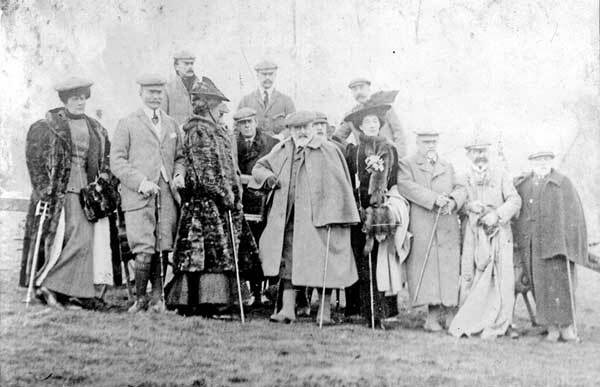 Although I have never heard the term “shooting box”, the concept seems to be quite like the royal and noble hunting lodges so popular in earlier times. Perhaps just smaller, or more simple. But even then, your author talks about lace, porcelain, silverware, freshly cut flowers in vases… Not exactly rugged camping conditions. That first photo is a gem. The women in particular look prepared for rugged conditions.